Our online process means you save. 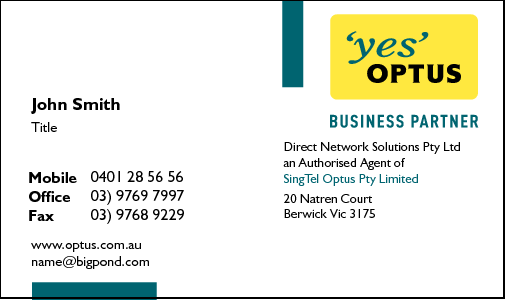 Our business cards are of the highest quality available in the market place today. Using your own design, or our extensive range of templates, our website has been developed to make your ordering experience easy, fun and the best value for money. 'I was utterly gob smacked at the quality and speed at which this whole process occured.' Michael - Sylvania NSW. 'WOW! To say I'm impressed by your service is an understatement!' Jason - Perth WA. 'Wow, I only placed my order three days ago and they arrived in today's post!' Peter - Sydney. 'Excellent service. I am very impressed by the high standard of service and quality of printing.' David - Wahroonga NSW. Search our database of pre designed cards. Design No 2233 Click the Card above. If you have your own logo or photo, or completed pdf artwork, you can upload these and create your own card now. Design No 289 Click the Card above. 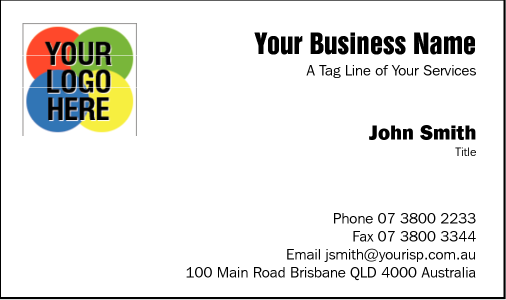 Business Cards with your Franchise or Organisation's Logo. Design No 1518 Click the Card above. Whether you are starting a new business, or you want to customise your existing business cards, or perhaps you need a personal card for your family details, you will find exactly what you want here. By selecting a template and customising it for your needs, the artwork is free. On top of this our quality is second to none. Click here for us to post you some samples. 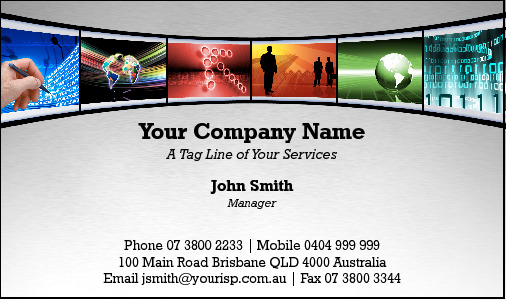 A business card is an inexpensive way of advertising yourself to friends and colleagues. With our quality and great prices you can avoid a cheap presentation of your business and services. We are printing and dispatching orders within approx 3 working days. Whether you are in Sydney or Los Angeles, London or Brisbane, Melbourne or Auckland, we service your market. Existing Customers can Logon here. If you have questions about our service, then please look at our FAQ (Frequently Asked Questions) page.